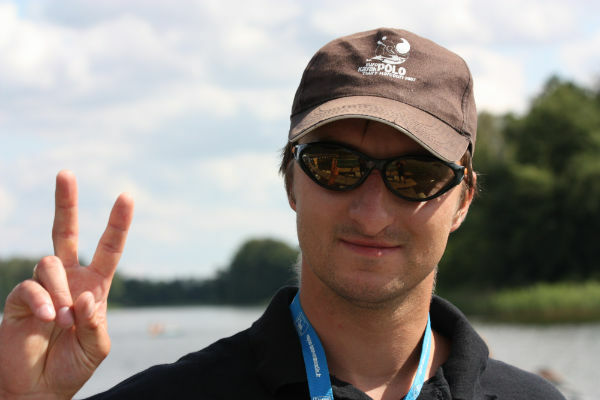 An article written by Jacek Sztuba - member of Polish national team from 1997 on his canoe polo playing career and the progress of canoe polo in Poland up to the World Championships in Milan Italy in September 2010. My adventure with canoe polo began in December 1996. I flew to Portugal for a training of judges, players and coaches in the discipline previously unknown to me. Training was conducted by experienced riders and trainers from France, in which participated people from other European countries (Portugal, Hungary, Spain). A few people from different parts of our country went there with me, who were supposed to propagate this "strange" sport in Poland. "Strange" because it was completely new to me and I did not even know the rules of the game. But I was quite amazed at what the French team could do with a ball on the canoe. I thought: I will never be able to perform such wonderful tricks and strokes. In 1997 national team was chosen and had its debut start in the second European Championship of Seniors in Essen. Most memorable to me were matches against the French (0:16), or Italy (0:12), and an unforgettable goal scored by "Paw" - the Italian No 1, who placed the ball in our net, being upside down and exposing only his shoulder over the surface of the water. The Western teams "crushed" us with the help of their equipment, individual skills and tactics. Our knowledge of the game left much space for improvement. We finished 12th place in Essen. 14 European teams competed. 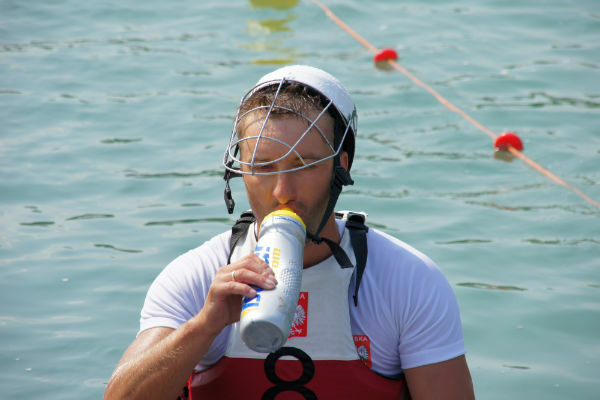 A year later, first Polish Senior Championships in canoe polo took place in Bydgoszcz. Me and my brother Bogdan, we gathered boys from the club and collected the available equipment. We played on borrowed fiberglass canoes and paddles we have adapted from the ones used in slalom. We have earned a historic gold, and I was the MVP. For many years we could not win the final of the Polish Championships, and the bitterness of failure was great - especially that the victory was often at our “paddle-tips.” To this day, we were never able to repeat that feat in the seniors category, but for all these years we played in the finals six times, three times we won the bronze medal, twice we took IVth and once the Vth place. A month after the first Polish Championships we flew to Portugal for the Seniors World Championship. A two-week camp in Bydgoszcz, representation of Polish seniors (including four juniors) flown to the place by plane, accommodation in comfortable hotel – nothing stood in our way. Unfortunately the equipment was still far from a dream. We had a chance to get out of the group, that is to enter the top 12 teams in the world. But during the match against Canada (the weakest team in the group), to judge from the U.S. woke us up from this dream. I was furious. I thought: we're helpless, they don’t treat us seriously, we do not have even one representative among the judges. We came in 15th place of 20 teams. During this trip I became aware, however, that this new discipline is popular not only in Europe but also in Brazil, Australia, Japan, Namibia, South Africa, Hong Kong and Taiwan. Today, our equipment does not deviate much from the best in the world - polish producers are getting better in their job with every season. During Polish Championships and national tournaments sponsors are giving away high-class equipment. We have international judges in our ranks. We have the facilities, a youth and junior teams both in men and women categories who stand on the podiums at major events (European Championships2002: U-21F - silver medal; EC2005: U-21M - bronze medal, U-21W - silver medal; EC2009: U -21M - bronze medal). So what else is missing? The seniors team is passionate about this sport, but it’s still a hobby: we work and study every day, we have no scholarships or training camps, and tournaments charges (including tickets costs) we often cover from our own pockets. Huge amount of work in the clubs and experience gained in competing finally starts to pay off. Coaches and activists that are almost fanatics allow for a slow but regular development of this discipline in the country. Sign of appreciation in the form of a spot on the podium at EC or even at the senior’s World Championship would be a beautiful seal to all these years of hard work of players, coaches, activists and presidents - I'm sure that it will happen soon. And the greatest reward will be including canoe polo amongst Olympic disciplines – according to international authorities this moment is approaching. During the last World Championships in Milan, for the first time in my life, I've seen fear in the eyes of Italians from so close. Our game was a last chance match to leave the group for both teams. Champions of Europe, and now World Cup bronze medalists had the advantage that even a tie would allow them to advance. We were winning for a big part of the game - for a few minutes even with two goals. But in the second half the hosts were able to even up the score. Particularly the end of the meeting was sensational - the judge did not count our last minute goal. According to many observers it was a mistake. After the game we congratulated the players from other countries, and I cried - they were tears of happiness and bitterness. We ran out of luck? Did we need more attention and support? The journey to Milan of the seniors was financed by the coach and the players themselves. Training camp lasted five days. We played on equipment borrowed from the club. We slept in tents, a few hundred meters in a straight line from the international airports of Milan Linate. We prepared most of the meals in the field. We drove 1300 km to Milan in a 20-year old vehicle accompanied by overwhelming heat. We have landed in the 14th place. I believe that this is the beginning of the road to the victory. I know that this team is prepared for success. I hope that the European Championships in Poznan in 2013 will motivate the authorities to improve conditions for our team at least a little bit (my hopes rising mainly because of the decision to purchase equipment for senior women in the category of U-21 - 4th place Milan with the ratio of scored to lost goals of 53:18.) ME will also be an opportunity for the conservative activists from the world of water sports, who reproduce stereotypes (that this discipline is uninteresting and has no future) to see how spectacular canoe polo is at the world level. Perhaps, this will also silence the voices forming a false image of this sport in the eyes of common people. I read a lot about this sport and it hurts when someone not very competent describes this discipline, gives incorrect or incomplete information, suggesting how to treat canoe polo. In many cases, the authors of these writings saw their last matches 10 years ago or see only the youngsters playing, or do not watch them at all. They believe that canoe polo is fun, does not require much effort and training in the winter season requires hiring expensive swimming pools. Many of these skeptics do not know that in winter we lift hundreds of tons in the gym, run hundreds of kilometers and carry on with the technical training unlit we’re totally sick of it, that we train on the water until first ice covers it. They do not realize just how complicated the game tactic can be, not unlike the most popular sports. The Polish do not get how rapidly this discipline is growing in the world. Equally low is the awareness that financing of canoe polo is still close to nothing. Current policies of the central government is to support only Olympic disciplines. Not every athlete, however, has a chance to make the cut in the disciplines where competition is so high. Many of them, with no chance of success, stray away from kayaking. Thus we lose potential talents in canoe polo. Maybe in a few years they would also have a chance to stand on the Olympic podium in this discipline. Good luck to all Polish canoe polo activists and fanatics. I hope that this discipline will be appreciated by others and that skeptics will release this "hand brake" they put on this sport a long time ago. There is a group of people who, despite resistance to push this car, is doing better and better. What would happen if the brake got released? I was there too ( Milan )! Watched this game. And hope that someday, the Brazilian´s Canoe Polo gets back on its feet and grow on this discipline, because we are stuck! Actually speaking I was astonished at the WC when the Polish Senior team was winning against the Italian team I believe with the score 3-1 just three minutes before full time and they played an attacking game instead of a defensive oneby keeping possession of the ball. In the remaining time they got 2 goals, the game ended in a 3-3 draw and they (the Poles) lost out in the Finals by goal difference! Pity.